The traditional Indigenous watercraft for the Murray River and the Ngarrindjeri community in South Australia is called a yuki’. It is made from a single sheet of red gum, taken from the side of a tree so that it already has much of the canoe’s curved shape already in place. Heat from a fire is often used to help refine the shape a little more, and two or three branches are used as beams to give it some additional support. It’s a delightfully simple shape and construction which is used throughout the Murray Darling River systems. Gumleaf is my concept of creating a simple plywood version; one that captures the basic elements, but interprets them in a modern way, guided by what the plywood is comfortable doing. I designed Gumleaf last year after I had met ‘Trapper’ and others from the Ngarrindjeri community at the Goolwa Boat Festival in late February 2011. 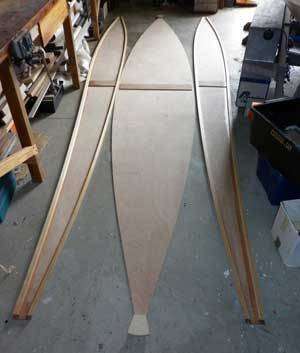 As well as showing them my watercraft research, I talked about the possibilities of building plywood yuki. Jessie Wagner, a Goolwa shipwright who has built other craft I have designed, volunteered to make one (if I could draw it up) with his manager supplying the materials. I drew up the plan and sent it off but Jessie could not get onto it until late August this year. He then built it in three days with a high school work experience student who loved the project. I like the idea of mixing the old with the new, so the design is a blend of the traditional craft built with modern materials following how best these materials want to form shapes. I chose a single chine cross-section shape as this is easy to form out of three panels. The sides are identical, so it’s easy to cut and join together. Plywood likes to bend around gentle curves in an even line. This suited the bottom profile of a yuki quite well, but the sides are curved throughout, whereas a yuki often has straight, almost parallel sides through the main part of the hull. The top edge or gunwale has a wavy line to it, which is a bit higher at the front, and this replicates how a yuki’ s edge makes its own form which is never straight either.My profile is a simple flowing line with a combination of concave and convex curves, fitted with a small stiffening piece of timber to firm up the edge. Two neat beams with brackets are put in place as supports, reflecting modern construction, but gently curved to sit comfortably with the organic shape of the hull. Gumleaf came out to be just over 4 metres long, 700mm wide and was made from two sheets of 6mm thick marine grade plywood. There are some small timber sections used at the edges and it has been varnished. It is big enough to take two people and wide enough to have good stability. In fact you can stand up in it and pole it along. So who said stand-up paddling was invented in the Pacific? It’s been practised on the Murray for centuries. Jessie launched the canoe with Dusty Gray on a windy Saturday in late August, and it was a big success. Jessie and Dusty were the ones who gave it the name saying it looked like a gumleaf as it sat on the grass waiting to try the water out for the first time. Gumleaf is now down at Camp Coorong, waiting for warmer weather to try it out, and I am hoping to hear from Major Sumner (Uncle Moogy)too, having discussed this idea with him as well. Uncle Moogy likes it’s modern interpretation but is intrigued by the higher sides as a derivation of a flatter yuki style. He is also keen to get back to working with his beloved red gum in canoes and blue gum for shields, again to get young people involved in traditional tools, canoes and ceremony. I think there is potential to do things like this along with many of the other Indigenous craft as well and I have already made a ‘gumung derrka’ or ‘nardan’, the type made famous in Ten Canoes. Meanwhile I have drawn up a curved cross-section shaped yuki for Dusty to build, this time using the strip plank method of construction. Images of Gumleaf taken by Charles Irwin, Alongshore Marina, Goolwa South Australia, who kindly donated the materials.